What strange juxtapositions. This image, from The Champ, a movie I watched with my family in a cinema in Blackpool in the seventies, (a movie that traumatised me!) is being used to signify the mourning of Muhammad Ali. DC comics have also published a superman comic front page from back in the day, Superman vs Muhammad Ali. There is something about using a picture of a blue eyed blonde boy mourning his father, a blue eyed blonde all American fighter who fought his way to the American Dream (albeit dying in the end). And there is something superior about the white alien Superman DC cover that doesn't sit right. My thoughts on Ali are simple really. He was an icon in the same mould as Malcolm X, Martin Luther King, Nelson Mandella, Malala, Rosa Parks on her Montgomery bus seat, Orgreave, Cuba, the Spanish civil war heroes, the liberators of Belsen and the Schindlers etc of the Nazi era, the paper cranes of Hiroshima, and the Palestinian flag- symbols of freedom against tyranny, injustice and the dreadful price the poor and exploited of the world pay in the corporate wars for resources and profits. Although I "get" the reason the blonde blue eyed boy is used to signify the passing of the Champ, and the iconic cover of the white alien superhero Superman, I don't think either really represent what Ali stood for. Watch his Parkinson interviews- he was a rich man. He fought not for more money-he fought to highlight injustices in Alabama, black communities in New York, Vietnam, Brixton and did not fight against the poor in foreign countries who were fighting their own battles against their exploitation, prostitution and CIA ignored and in fact promoted, drug induced disunity and death. 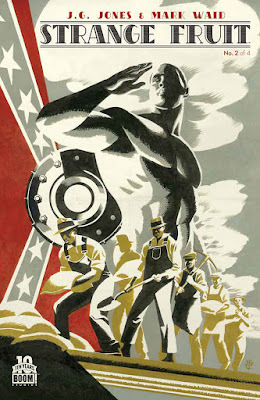 I recently found a comic in Forbidden Planet- "Strange Fruit," about an alien who falls from the skies into the Deep South of the United States in the 50s/60s when the civil rights activists were beginning their struggles. This "Superman" is a seven foot black man- who is incredulous at the barbarity of the white supremacist people, lynching and segregation. He fights on the side of the oppressed and is protected by that community. Even for me, a lefty, the inclusion of a black superhero in the pantheon, not fighting green goblins or other white corporate world taker overers, but instead highlighting and fighting against the racial violence so prevalent STILL in America (and indeed here) is uncomfortable reading. REAL injustices highlighted and fought against- but ultimately it is fantasy. No black, Muslim, South African, Pakistani, Palestinian, Irish, Jewish, Syrian, superhero ever falls from the sky, swooping down to save the drowning children in the Mediterranean. People like Mohammad Ali highlight these issues. People like Heather Ripley give their time to fight the injustices and exploitation and racism and bloody corporate murder. The real heroes are the people fighting for their lives and the people pulling them from the boats, feeding them, and helping them regain their lives. Ali helped in more than one struggle by using his celebrity- and challenged the culture of white supremacy, American and Western wars and sectarianism. A more fitting image in my opinion, are the tears of children trapped, stateless, homeless, parent less waiting for us to act in the way Ali, Rosa Parks, Mandela, Malala and others use their celebrity to spur the world on- to notice- to question and to pressurise those who have pushed themselves into positions of power. If Ali is a symbol, it must be a symbol of the exploited and oppressed punching through the establishment to create space for others to gain confidence to fight injustice. He and others of his generation created something dangerous to the establishment- a confidence amongst the oppressed that they could overcome. He isn't a symbol of the American dream- he is a symbol of those left behind by a white man corporate nightmare. And the poor and oppressed shall overcome. 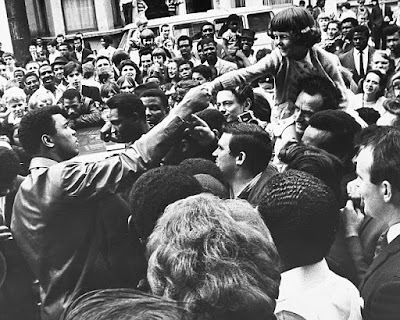 The fight Ali took on, to help unite the exploited peoples of the world goes on- and we should be heroising those fighting to pull victims from the oceans and swamplands of the profit takers and the powerful.